Take a quick moment to think back through the last seven days of your life. Recall places you went: restaurants, shopping, perhaps traveling. In those seven days odds are excellent you probably experienced, at best, mediocre service in some regard. If you had truly memorable service, the kind that makes you want to convince others to patronize said business, then you are in the minority. 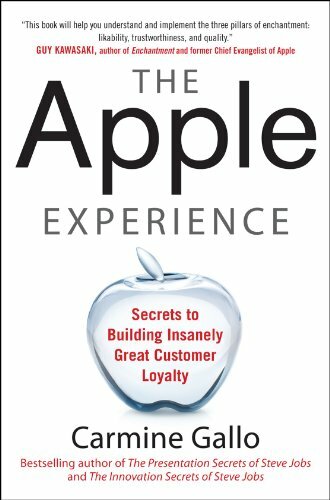 The Apple Experience: The Secrets to Building Insanely Great Customer Loyalty is, fair to say, a most welcome antibiotic for a woeful and ailing service industry. Think divorce isn’t relevant to a discussion of customer service? Think again. Studies have shown that a large percentage of divorces are not so much the result of relationship symptoms—like an extramarital affair—but rather take root much more deeply: Most such affairs come about because one partner no longer feels special—which of course the “other/new” party accomplishes. That’s a painful yet incredibly potent way to truly understand what great customer service can do for one person. Wouldn’t you like to know how to keep your customers and clients so happy that they not only stay with you and return again, they also actively evangelize your business? Carmine Gallo doesn’t ask you simply to look through the glass doors of Apple stores, he wants you to study and embrace the simple elegance—and a large part of that experience has little to do with selling, but rather relationships. Mr. Gallo acknowledges that not every business model is conducive to a literal application of Apple’s “5 Steps of Service,” but within The Apple Experience he provides the tools and reasoning necessary for any owner, manager, or supervisor to elevate their offerings, to differentiate themselves from the competition not from a cost perspective but from the approach of touching people’s lives. Apple’s word of choice is “enriching:” as in the ability to achieve a deeper emotional connection with employees and customers. • enriching lives is not just for customers and clients, but especially important: for your employees. That last bullet point gets a good deal of real estate in the book and for good reason. Once again, recall the last few times you experienced standard, blasé service, people in positions going through expected motions. The author states early on the seemingly obvious yet most often overlooked facet of great service: “Gallup has found that 71 percent of employees in the United States are “not engaged” or worse, “actively disengaged and emotionally disconnected” from their workplace.” Outside of the all-important paycheck, it’s hard to remain passionate about a job you don’t care about or a company that lacks vision. Mr. Gallo fans the flames of another incredibly important facet of human motivation: that monetary incentives work only to a small degree. Most people thrive upon—and want—some form of praise; and many want to feel like they are part of something bigger, a genuine part of helping their company grow. These are psychological intangibles that wield far more power than mere trinkets or bonuses. Apple, via Steve Jobs’s vision, has taken a retail concept most analysts predicted would quickly fail and turned it into a stunning revenue juggernaut with an almost rabid following. From the very beginning, The Apple Experience compares religion to the loyalty/fervor Apple engenders. The parallel is explained clearly enough in the book, and any reader serious about learning and profiting from Gallo’s research will completely understand the analogy. The author is to be applauded for calling out Sears customer service (and others) by name. It certainly would have been far less troublesome to state something like “a once great retail giant” or “an institutional retail chain.” Instead he chooses to take the shot straight up, with no chaser, and juxtaposes his personal experience with Apple’s customer service. The upshot? A social media–heavy consumer base can do damage more quickly and more easily than at any other time in retail history. Any of these companies can change their culture. It must come from within, and it must be more than lip service. Mr. Gallo challenges the reader to go into any Apple store and experience the principles he outlines for themselves, to observe interactions between Apple staff and customers, to pay attention to expressions and body language as customers exit the store. The Apple Experience is bursting with paradigm shifting ideas and plenty of solid reasons for putting the Apple model to work, supported by the successes of top tier companies: FedEx, Zappos, Disney, Lush, Outback Steakhouse, just to name a few. Their stories hammer in the notion that ho-hum customer service most other companies egregiously pass off as a quality “customer experience” is, in a word, not. “Average is officially over” the author quotes. Say what you will about the Apple brand or its products. From crossing the store threshold to the very box your purchase comes in, every detail of the Apple experience is designed to touch a part of our nature that most retailers utterly disregard. Over ten years of retail dominance . . . isn’t it worth considering what Apple is doing right? Any service provider, doctor, lawyer, bartender, accountant, or tailor can leverage The Apple Experience to work in their favor. The first question to ask is sublime yet simple: Are your current results satisfactory . . . or do you want insanely great service—and the loyalty of your customers that goes with it?